Noon rolls around, your Mickey waffles from breakfast this morning are longer fueling your feet, and the scent of every popcorn cart is starting to seem intoxicating – what do you do? If you’re like most people, you probably dart into the closest quick-service restaurant for a subpar burger to keep you going until you reach the Enchanted Tiki Room for an afternoon Dole Whip. However, if you want to experience more of Disneyland’s delectable dishes without adhering to an entree, I recommend skipping the sit-down feast altogether. Personally, I’m not a huge fan of the counter service options at Disneyland Park. Aside from Red Rose Taverne, which is only around for a limited time, I have a hard time finding choices that appeal to me or offer anything out of the ordinary. So, when I discovered that some of the most unique and yummy eats are scattered throughout snack stands around the park, I began gravitating to those instead. Plus, as someone who likes to munch as much as possible at the parks, I have learned to pace myself. I can’t sit down for a giant greasy meal in the middle of the day if I’m going to stand a chance at riding Space Mountain over and over, or standing out in the heat for a parade later on. I’d rather stagger my intake so I can satisfy my appetite appropriately as the hours go by. Rather than navigate a crowd-filled lunch spot, scout out a seat, and ultimately leave feeling like I wasted my stomach space on average-tasting fries, I like to use the middle of my day to try a series of savory snacks I wouldn’t normally be able to fit in between meals. If you want to try switching things up too, allow me to show you the way. Think of it as a self-curated foodie tour throughout the park, a challenge to try the greatest hits of each land, or just your very own unofficial food festival. Making your way around the park in a clockwise fashion, your first bite is at Bengal Barbecue in Adventureland. Offering a variety of six scrumptious skewers ($3.99-$4.99), you can’t go wrong with getting one all to yourself, or sharing a few with friends to get a taste of each. 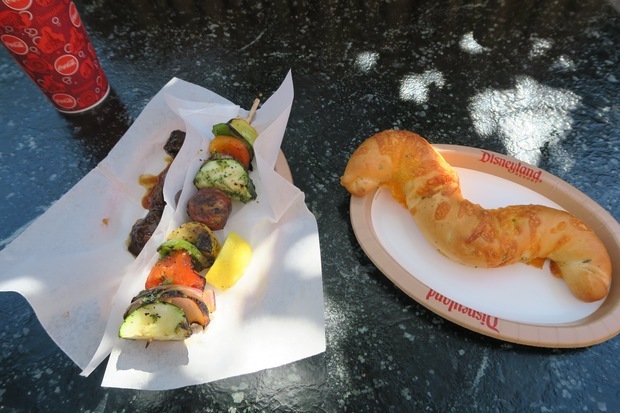 My personal favorite is the Outback Vegetable Skewer ($3.99), but the Safari Skewer ($4.49) is a fan favorite with its bacon-wrapped asparagus. Resist the urge to fill up here first, but feel free to swing back around if you’ve got a hankering for the grilled bread (aka Tiger Tails, $3.99) or Ahi Poke Spring Roll ($6.99). 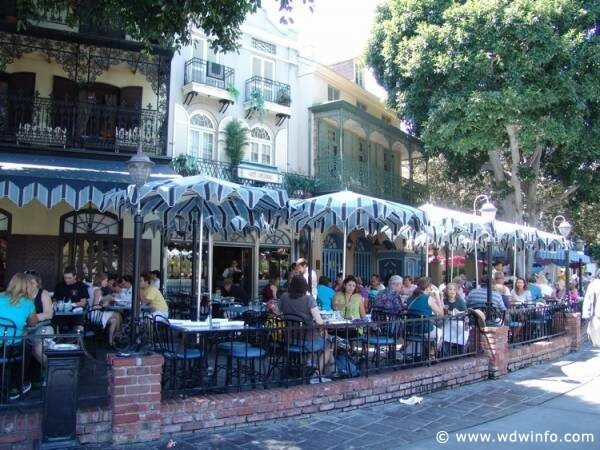 Next, stroll over to New Orleans Square for some New Orleans fare! 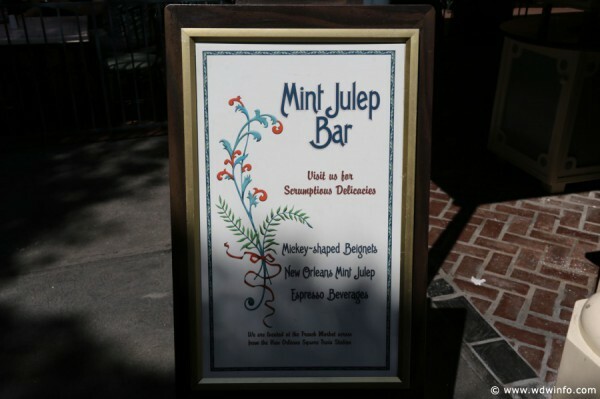 The Mint Julep Bar, located in the French Market seating area, offers up Mickey Beignets (three for $4.49 or six for $7.49) and, of course, non-alcoholic Mint Juleps ($3.99). Yes, beignets are basically donuts and maybe not typical lunch food, but you’re on vacation, right? Once you’re all sugared up, follow the road to Frontierland where you can pick up a Jumbo Turkey Leg ($11.75) at the cart beside Big Thunder Mountain Railroad. If you haven’t yet experienced this right of passage, this is your opportunity! Extremely salty, but always a good way to get some protein without even having to sit down. If you’re craving a return to carbs, just weave your way over to Maurice’s Treats, a snack cart in Fantasyland. Nestled among a variety of sweets on its roster, you’ll find the flavorful Cheddar Garlic Bagel Twist ($4.99). Enticing all on its own, it’s made even more marvelous with the marinara dipping sauce (for an extra $.89). Winding back behind the Matterhorn, but before you hit Autopia, pick up a Chili-Lime Corn on the Cob ($4.79) at Edelweiss Snacks. This is a tasty twist on something more traditional, but I promise you you’ll at least get a kick out of the fact that you’re eating corn on the cob while you walk around a theme park. 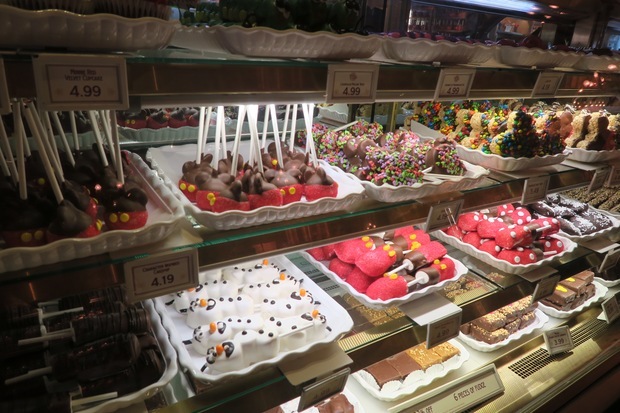 To finish up the fun, head back to Main Street USA for dessert! 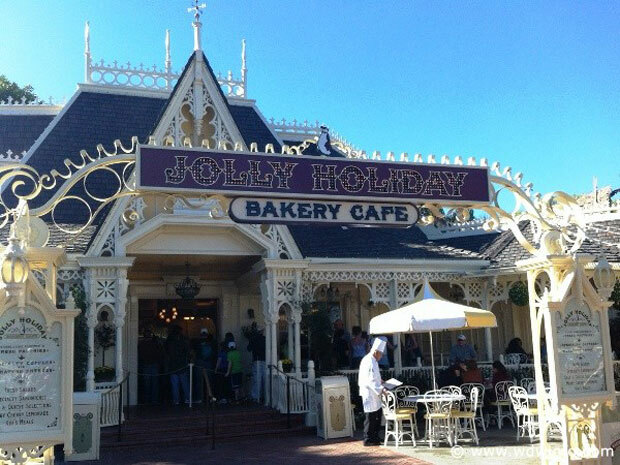 Stop into Jolly Holiday Bakery and you’ll find a glass case of mesmerizing baked goods to choose from. 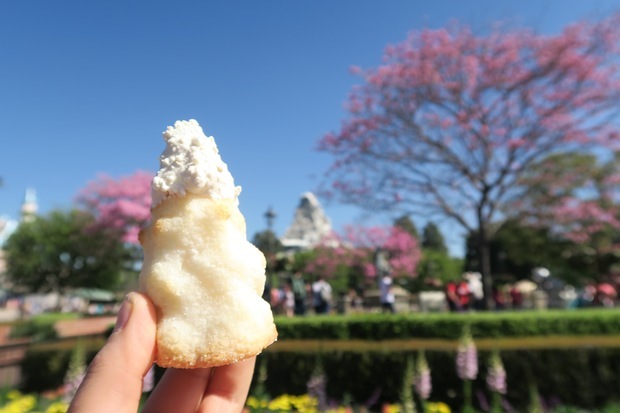 I suggest the Matterhorn Macaroon ($1.99), as it makes a fantastic photo op with its perfectly coated white chocolate top, but the Bundt Cake ($5.19) and Macaron (prices vary seasonally) are just as delicious. For bonus points, especially if your appetite is non-existent at this point, just grab a to-go confection at the Candy Palace for later. You can’t go wrong with any of these offerings, but my favorite is the Mickey Chocolate S’Mores Square ($4.99), featuring gooey marshmallow and crispy graham crackers all covered in chocolate with a mouse-shaped candy dotting the top. If you’re totaling these prices up and starting to think I’m insane, I hear you. This strategy is certainly not meant to be taken on alone – although, I’m not not throwing down the gauntlet. Feel free to pick and choose what you try, pace yourself to keep from getting sick or uncomfortably full, and split things with friends to keep this outing as budget-friendly as possible.